A lifetime of good home care techniques will reduce the number of dental care problems as you age. Brushing twice a day, flossing daily and routinely visiting the dentist will ensure that plaque does not rest on the teeth long enough to form decay and that gum tissues are kept healthy. Even with good home care and regular dental visits, oral health can degrade as you age. 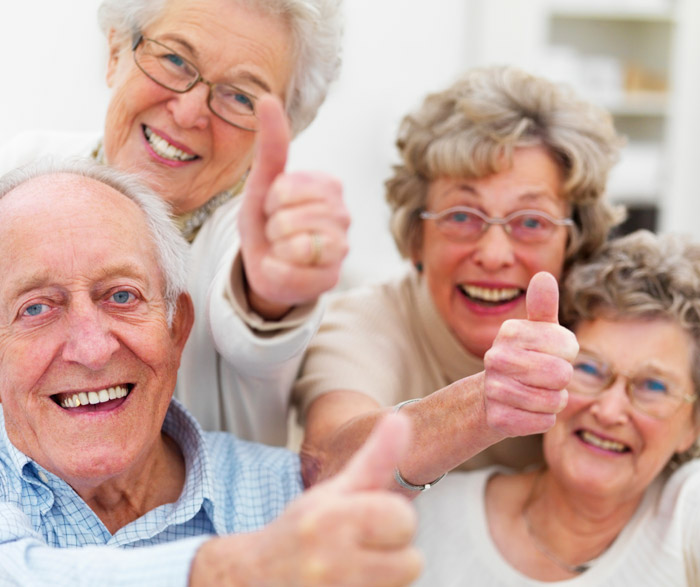 Major contributors to dental problems in seniors are medications, reduced dexterity and chronic or systemic diseases. Tooth sensitivity is a common compliant in the elderly. This is because enamel is worn from the teeth over time, exposing the dentin and the channels that lead to the pulp of the tooth. Also, the gums begin to recede. As this happens, the roots of the tooth are exposed. Tooth roots are not protected by enamel and are more vulnerable to sensitivity. Anti-sensitivity toothpastes and fluoride treatments can decrease the effects of gum and enamel erosion. Dry mouth is often a side effect of medication and can contribute significantly to other dental problems; when left untreated, dry mouth increases the likelihood of decay and gingivitis. Dentures are often worn by elderly patients. Although they are a common alternative to natural teeth, dentures require strict adherence to dental and gum tissue care practices. Cavities and decay on the root surfaces of the teeth are more common in older adults. So it’s important to brush with a fluoride toothpaste, floss daily and see your dentist regularly. Gum disease is a common oral health concern for patients of all ages but it is especially prevalent in the elderly. Poor oral hygiene, systemic diseases, stress, smoking, medications and bad diet can all contribute negatively to gum disease. The early effects of gingivitis are completely reversible if discovered in time. It is important to visit the dentist regularly to ensure that there have not been any changes in oral health. or Call us on 0800 111 6623 .